The fundamental rules to paint with the technique of the Watercolor are some rules and logical ideas to make that painting with watercolors become easier and more controllable and comfortable for the artist process. To know how to draw. You can also use the watercolor pencils. Painting from the lighter towards the darkest. Learning to control the transparency and opacity of the paint. The color is rinsed with water, not with the white color. This allows that the tone persists and it has more color quality. To work without drawing, but with the irregular and without sharp edges spot of color. Ideal for fog, sunrise, sunset, atmosphere, fog, and so on. Requires how to do the shape with the first touche, so, unretouched. Steady hand..
Open whites. To clean an area inside a wet spot of color is easy with a dry brush, a cloth, or a paper or cotton-tipped stick. Control of the stroke. How to do the stains that are desired. Attention to contrast and atmosphere. Using auxiliary techniques: Torn, grooves, solvents, salt spray, wash, sponge, and others. Creating atmospheres: painting skies, clouds, mist, water, etc..
Texture creation. Especially using glazes, dry brush and auxiliary techniques. To works with special brushes to learn how to make accurate forms and how to apply final touches. 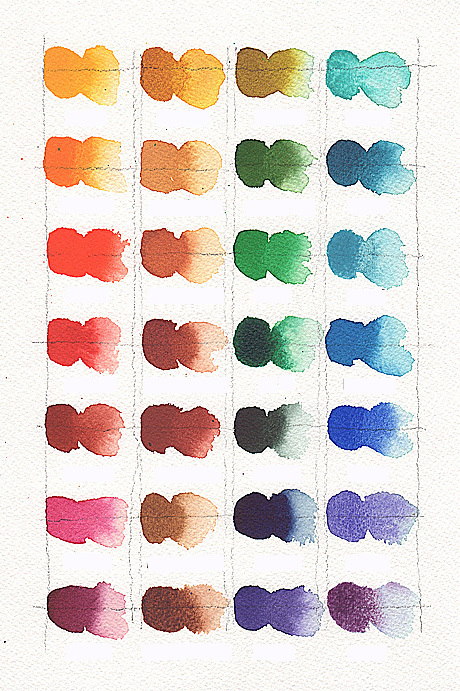 Exercises with mixed media (mixture of pencils, crayons, charcoal, pastel, oil, ink, gouche or temperas, acrylic, etc). Note that we never put water paint over the oily paint, but when the water has dried we can put oil. Exercises where we can paint the water: calm, agitated or falling waters, rain, reflections, etc. Composition exercises. Meditation on the line, shape, and every point … graphic elements that belong to the image. For example, the Kandinsky abstract compositions painted with Watercolor.